Look at the expression on the man's face: a vacant look of terror. A few seconds after this picture was taken the man died and his only crime was that he was a tribal in a state ruled by the Communist Party of India, the Marxist faction. Madhu was a tribal youth from Attydapy, a palce made famous by the struggle of Janu whose fast highlighted the plight of tribals in Kerala. Since the CPM faction has come to power, killings have become an endemic party of Kerala politics. The CPM has been involved in systematically terrorising its opponents in Kannur and Malappuram districts.Estimates vary. However nearly 40 BJP and RSS workers have been hacked to death since the Marxist faction came to power. The Popular Front of India, a radical Muslim outfit has been give a free run and it is suspected that the Marxists have outsourced the elimination of their opponents to the PFI and even mainstream Indian politicians like Hamid Ansari, the former Vice President of India, patronise this outfit. Since prosecution is in the hands of the State Government, there is little fear that there will be justice. And since RSS and BJP cadre are being systematically targeted, it is possible for the Marxists to maintain deniability and claim that it is the usual Hindu/Muslim problem. However, the failure of the state to act and apprehend the criminals is sufficient proof that the CPM organization supports these extra judicial killings. The rapid strides taken by the BJP is shoring up its support base is causing alarm bells to ring. The BJP even won a seat in the last Assembly election. There is a caste dimension to the violence as well. The backbone of the marxist faction which is entrenched in power is the Ezhava community, a backward caste that is now powerful. The Tiya, are contesting the hegemony of the Ezhavas and they have rallied around the RSS and the BJP. The Muslims who form a sizable part of the electorate are feeling the heat of the changed political dimension and are resorting to unabashed violence. 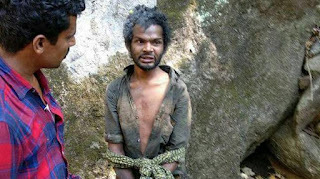 In fact the majority of the men involved in the lynching of poor tribal, Madu, are muslims. And there is apprehension that the state willgo soft on them for political reasons. The lynching of Madhu, a poor starving tribal who stole 200 Rs worth of rice exposes the hypocrisy of the Indian mainstream media. The Liberals went ballistic over the killing of Gauri Lankesh and one or two from their fraternity. It now appears that all the killings were in the nature of private revenge and had nothing to do with the Central Government though there were loud protests over the killing of Kalburgi, Dhabolkar and Lankesh all of which took place in Congress ruled states. Now this crime committed by Muslims in a Communists ruled State is proving to be a real dilema. The liberals are brought up to believe that crime with a gree tinge is best swept under the carpet and this has happened.